We’re holding a public consultation to hear your views on the existing road and our proposals on how to improve the route around Whitehaven. 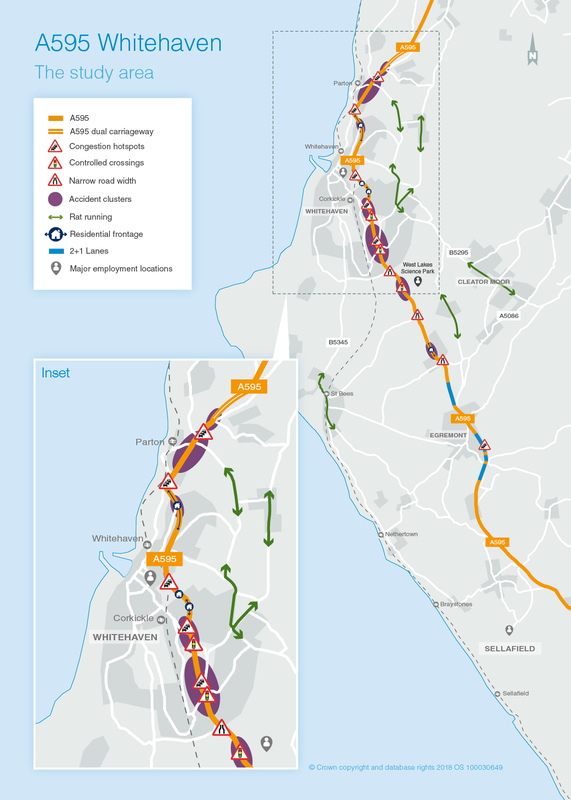 We would also like to take the opportunity to gather feedback and information on the section of the A595 to Sellafield to feed into our long term strategy for the route. You can help us by sharing any problems you are aware of and by providing your views on the potential solutions we’ve identified. Your comments will help us better understand the local area and transport issues. We will listen to everyone’s feedback and we’ll consider these during the development of any improvements. The consultation will run for 6 weeks, between 7 November and 19 December 2018. Cumbria is home to a number of important industries, employing thousands of people in the region. Altogether, the nuclear and energy sectors, and their suppliers, employ around 27,000 people, with a significant proportion in West Cumbria. This includes Sellafield, the largest nuclear site in Europe, where there are over 10,000 on-site and associated local areas. In the future, Cumbria is expected to attract over £60 billion of investment along the coast. This includes a new nuclear power station at Moorside, plans for a new National Grid network in the county, and proposals for a new mine close to Whitehaven. To support this investment and boost the economy, the current road network will need to improve. See the map below for the study area. The A595 is an important route and caters for freight, local and agricultural traffic. The A595 is a single carriageway through the study area with a lack of overtaking opportunities. The A595 in West Cumbria serves several towns and villages, with several sections where the road passes directly in front of residential properties. There are many junctions along the route through the study area, which is approximately 7.3km in length. Once the consultation period has closed on 19 December, we’ll analyse all responses and compile them into a consultation report summarising the feedback received. We will use this feedback to inform what improvements we should take forward for further development and assessment work. We will also use any feedback received about the local area to identify any specific constraints we need to be aware of along the route and within the wider study area. This could include known environmental constraints or information around future developments. This information will help inform the design of any improvements. Once we have reviewed the design, we will carry out another round of public consultation in the future. There would also be a considerable amount of investigation work, including environmental impact studies, wildlife surveys and detailed traffic modelling.